Short term predictions are treacherous. There are so many factors that could impact the timing and the size of a market move, that it is easy to be wrong on direction of a move, the extent of the change, as well as the timing. Despite that, a number of points lead me to predict that the prices of gold and silver are due for major price spikes by the end of next month. This past week saw gold reach another all-time high price (ignoring inflation, of course), when it reached $1,254 during intraday trading in the US. Friday’s Comex close of $1,228.90 set an all-time high for the end of the week close, which is an important signal to technical traders that it is time to add to their gold positions. The New York Times has consistently skewed its news coverage to either ignore positive developments for precious metals and only occasionally ever mentioned gold and silver at all, invariably with a negative slant. The June 13 edition of the online Times carries one of the most positive stories for gold that has appeared in the mainstream media in a long time. The story is titled “Uncertainty Restores Glitter to an Old Refuge, Gold” and can be read at http://www.nytimes.com/2010/06/13/business/13gold.html. The article quotes what used to be considered crackpot ideas like 1) the possibility of merchants refusing to accept paper money and only accept payment in gold; 2) the debts of the United States, Japan, and Britain could be unsustainable and could hurt confidence in all paper money; and 3) the global credit system could be now entering “the end game.” This story represents a major breakthrough for covering the positive aspects of precious metals and the heightened risks of owning paper assets like currencies, stocks, and bonds. The Economic Cycle Research Institute (ECRI) Weekly Leading Index (WLI) has been one of the most accurate predictors of the short-term economic outlook. Around the end of 2008, the WLI started to rise. Late in 2009, the WLI chart showed a decreasing improvement. For the report issued for the week ended June 4, the WLI turned negative, possibly pointing to another recession coming soon. The shape of the recovery spike of the WLI is eerily similar to that from 1971-1973, which foretold the stock market crash of 1973-1974, where it took many stocks until the 1980s to finally recover lost ground. The June 4 WLI is sending a signal to sell stocks, and professional money managers are paying attention. One weekly report does not confirm a pattern, but you can be sure that the professionals are getting more nervous. The Dow Jones Industrial Average (DJIA) fell below 10,000 this past week for about 48 hours. The DJIA did end the week slightly over 10,000, but the pattern of trading blatantly shows that the recovery was due to market manipulation by the US government and its trading partners rather than the collective investment decisions made by investors. I am not a stock expert, but I consider the DJIA to be at high risk of seeking lower levels in the coming weeks. On June 9, at the Financial Times Silver Conference in London, John Levin, who is the Managing Director of HSBC Bank’s Global Metals and Trading operations said he has had conversations with a number of top asset managers in the US who have asked if HSBC has the capacity to store significant gold purchases in HSBC’s vaults outside of the US. Levin claimed that the reason given is that the asset managers have a fear of possible “gold confiscation” similar to that inflicted on Americans in 1933 by then President Franklin D. Roosevelt. Market analyst Adrian Douglas, publisher of the Market Force and whose research I have previously cited, issued a statement on June 10 that he suspects that Levin’s remarks are “propaganda.” As support, he cited the London Bullion Market Association (LBMA) report released on June 10 showing that May 2010 gold and silver trading volume had increased by double digit percentages, both for the month compared to May 2009 and for May 2010 year to date compared to comparable prior year data. In Douglas’s opinion, the surge in volume is putting a tremendous strain on the ability of the LBMA to meet delivery requirements. He suspects that Levin’s comments were really meant to scare investors away from storing gold in the US, with the LBMA being the beneficiary as the primary alternative. This would lessen the LBMA’s delivery problems. During the past week, Federal Reserve Chair Ben Bernanke went out of his way to proclaim that the economy was on the mend. This was contradicted by a letter that US President Barack Obama sent to Congress on June 12 asking for a special appropriation of $50 billion to help save the government jobs of teachers, police officers, and fire fighters, all categories of employees that include a disproportionate percentage of supporters of the president’s party (surprise, surprise). This letter contained repeated references to a bleak economic outlook such as “We are at a critical juncture on our nation’s path to economic recovery.” He referred to “the urgency of the continued economic challenges we face” and “the devastating economic impact of budget cuts at the state and local levels.” If top officials of the current administration are simultaneously issuing contradictory statements about the state of the US economy, the only safe conclusion is that the truth is no better than the bleakest of comments and could well be even worse. There is a track record that purchasing gold and silver during the months of June and July has proven later on to be better than average times to be buying, but the correlation is not strong enough for me to consider it as support for my prediction. As for my prediction of much higher gold and silver prices, everyone probably wants to know what I anticipate. To be conservative, I think that gold will easily surpass $1,300 with $1,500 a realistic possibility. For silver, I forecast that it will easily top $20, with the potential to reach $25. In the long run, I foresee much higher prices, but these levels would be a good start. Sprott Asset Management LP has just released a 2-page essay by John Embry, its Chief Investment Strategist, titled “Reasons To Own Gold.” As usual Embry manages to present a concise list of 17 reasons why he anticipates much higher gold prices. I love the essay for its brevity and clarity. You can read it at http://www.sprott.com/docs/Reports/reasons_to_own_gold.pdf. I’d like to throw out a point about price manipulation. If the govt. is trying to protect the value of the dollar by manipulating the price of gold, it seems to me that they have picked a pretty poor way to do it. It seems that the value of the dollar is much more directly related to the price of other commodities. (That also raises the question of whether the commodity price determines the dollar value or the dollar value determines the commodity price?) Gold prices may be manipulated, but frankly, the impact on the dollar over the long haul seems to be pretty erratic and insubstantial. It seems as though they have other tools or influences available that would be far more direct and effective. But watch for the Silver Users Association to announce regarding the $1 trillion minerals bonanza just announced by the U.S. military in Afghanistan, “huge silver deposits near surface minable at .48 cents per ounce to flood world markets by spring 2011” OR some such wishful misdirection. Chapman said recently there would be a major lawsuit against JPMorganChase re silver depressive tactics. Only time will tell if he heard right. In the wake of the 1980 silver crash, the “Free Market Compensation Group” sued for $51 million in damages and to my knowledge, got nowhere, though one silver long is known to have gone BLIND due to stress! Friends, “sell no silver for under $500 per gram!” starve out the SUA. If Obama does an August 9, 1934, throw your silver away or fight it on Capitol Hill and in the courts. It just keeps getting dropped from the radar because no one has been able to come up with a workable business plan to go develop it. will too by the end of the year, of course. my position : call 1375 dec sp 500 at $1.20/contracts. + my long shots calls on silver and gold. gold $2010 silver $28 before dec.
Maybe one of the best year ever! Considering the massive quantity of debt instruments floating around the globe, aka paper money, in relation to the above ground supply of silver and gold, the price suppression and manipulation schemes are wildly successful it seems to me. I have difficulty with the fact that so many do not discuss, perhaps because they do not recognize, that gold/silver have been converted to paper in a number of forms (collateralized)to facilitate manipulation plus leveraging. Bullion is more difficult to fiddle – especially if one accepts the fact that gold and silver are money, not commodities – but it happens. Once converted to paper, any doge is simple. If gold is irrelevant, why did Nixon take the USD off the gold standard in the 70’s. Anyone who watches the Kitco charts daily and especially when the shorts are due can see the manipulation plainly in real time. Why? Because gold/silver are not copper or pork bellies; they are different. 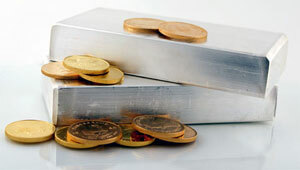 A reverse or inverse relation to the USD was maintained for quite some time in NY, and the LBMA hit a bullion shortage within the last year that saw them pay full value plus 25% in cash when bullion was unavailable or deliveries of full amounts in bullion plus 25% cash penalties for late delivery. It was common knowledge – and understandable after Dubai and the Chinese had pulled their bullion and put it in their own vaults. Now the gold price seems to run with the USD, but it is kept within a bank by the Feds bank – for a fee with all losses covered. High gold is a perceived threat to any fiat currency, but especially the world reserve. The US will not relinquish reserve status easily. But, as you know the pressure is on. With rejection of the IMF suggestion for a new fiat reserve, it seems that, eventually, we will again have an asset backed reserve – gold, silver oil and perhaps other commodities. Consider the panic in the EU and Japan in recent months – the spot price hardly moved. One economist called it inelasticity of demand on price. It was. But why? There are two possibilities….neither of them speaks well of the powers that be and both point out that we the people are price3 takers, not makers. Surely you don’t think these things accidental or spontaneous?